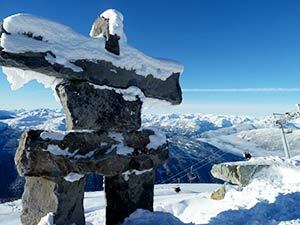 Whistler is, without doubt, one of the top ten finest year-round resorts in the world. Whistler has continually received awards and accolades in a variety of classes including the "Number One Ski Resort in North America," "One of the best golf resorts in the world" and "Best overall resort design." It is most well known as a world-class ski centre, but it is equally attractive as a summer destination with a wide range of activities. In fact, if you want you can actually still ski in summer as some runs on the glaciers high in the mountains are still open. 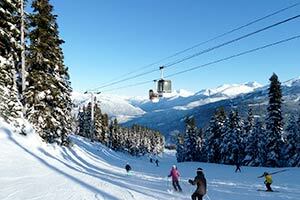 Whistler is situated 120km north of Vancouver in the Coast Mountains of Western British Columbia. The resort town of Whistler (known as the village) is located between the two peaks of Whistler Mountain and Blackcomb Mountain. These two mountains produce a year-round selection of leisure opportunities that would be hard to surpass anywhere. Summer activities include great hiking, swimming, sunbathing on lakeside beaches, cycling or just taking a gondola or chair lift up the mountains to admire the magnificent view. If Vancouver is the playground for adults, Whistler is the playground for those who enjoy sports and the enjoyment of the after-party. Combined together, the mountains at Whistler, BC - Whistler and Blackcomb - provide 200 + runs and skiing that is second to none. The incredible layout of the resort includes mountain-top chalets and the most luxurious hotels and :smp. From everywhere in the village you are treated breathtaking scenery in summer and winter. All of this can be found just a two-hour drive along the Sea to Sky Highway, which in itself is an experience as it rises from sea level to just under 4000 feet. 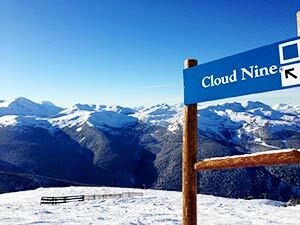 What makes Whistler a premier resort area, you ask? Perhaps it the idyllic setting nestled in the coast mountains, surrounded by alpine lakes and dense forest. Perhaps it is the skiing resort that has constantly been ranked in the top 5 on everyone's best-skiing list. For you it might be the hundreds of acres of trails that make up the Whistler Mountain Bike Park. Even still, maybe you came for the Arnold Palmer designed Whistler Golf Club or Nicklaus North Golf Course or maybe it was Fuzzy Creek. Visit now to experience these things but don't forget that Vancouver-Whistler were chosen to host the 2010 Winter Olympic Games from February 12th to 28th. Take our word for it, this is a premier travel destination. The UK paper the "Daily Telegraph" voted Whistler, BC, the Best Ski Resort in October 2000 and 2001. "Snowboard Life Magazine" rated Whistler, BC, the Number One Snowboard Resort in North America in 2000. "Vancouver Courier" voted Whistler, BC, the Best Weekend Getaway Best Ski/Snowboarding in their Reader's Choice Awards in 2000. "SKI Magazine" readers voted Whistler the Number One Ski Resort on the continent in the magazine's 1999,1996 and 1995-reader survey. "Skiing Magazine editors" selected Whistler as the Number One Ski Resort in North America in 2000, 1999, 1998 and 1996. Japan's publication the "Blueguide Ski's Ski Magazine" voted Whistler, BC the # 1 International Destination for 11 Consecutive Years. The US publication "The Seattle Magazine" voted Whistler, BC, the #1 Ski Destination in Pacific Northwest for 4 Consecutive Years. "The Econoguide - Ski and Snowboard America" made Whistler, BC the #1 Ski Resort in the West in 1999. Golf Digest Magazine rated Whistler as one of the top 50 Greatest Golf Destinations. Below is some pertinent information about the ski mountians in Whistler BC. Terrain Type: 20% beg. 55% int. 25% adv. 15% beg. 55% int.